Fear not a high kick. PWR BTTM perform during NPR Music's annual SXSW showcase at Stubb's in Austin, Texas. But the pop-punk band, expanded since its formation from a duo to a four-piece with the addition of keyboardist Cameron West (who also plays French horn) and bassist Michael Politowicz, also paused for lengthy, heartfelt, frequently hilarious digressions. For every aside about the power and importance of music as a way to unite and protect the vulnerable, Ben Hopkins and Liv Bruce would hold court about vegan hollandaise sauce, the importance of tipping bartenders, or a fervently expressed desire to "drown in Topo Chico." 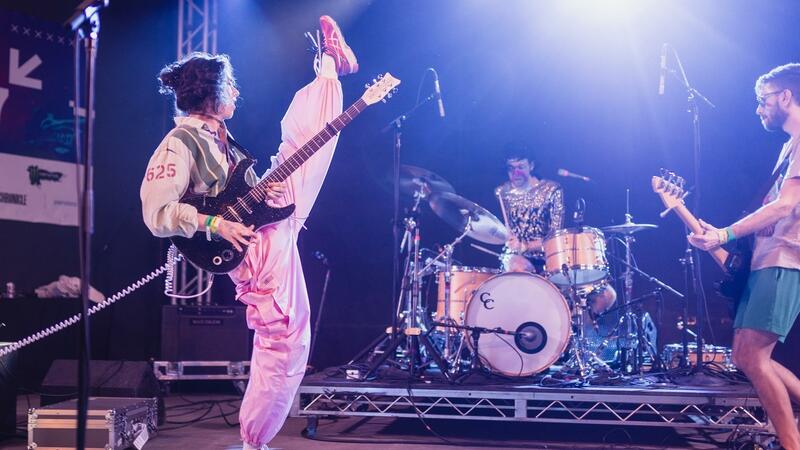 PWR BTTM weighted its set heavily toward material from the forthcoming Pageant, due out May 12 — and even brought out Alynda Lee Segarra of Hurray For The Riff Raff to join in for a shared performance of its song "LOL." And, in keeping with the free-wheeling banter that preceded it, Hopkins had to pause to praise Segarra's outfit: "You look like Patti Smith if she had an Etsy store." For PWR BTTM, a perfectly balanced cocktail of blunt aggression and pointed playfulness — wryly self-effacing but always boldly rendered — proved virtually impossible to resist.